Organizing Tips for Kids Toys - it's BABY time! Now that christmas is behind you and all the gifts have been opened you look around and think, ‘Where am I going to put all of these new toys?’ You can do what I always do which is go through the old toys they don’t play with as much and put them away then rotate them to keep the kids from getting bored with the same thing all the time or donate them. To help keep things well kept together and not have your home taken over by the kids’ things I’ll share some organizing tips for kids toys in the most common rooms of your home. When you have a baby, there’s really only so much that you need and the rest is just extra. 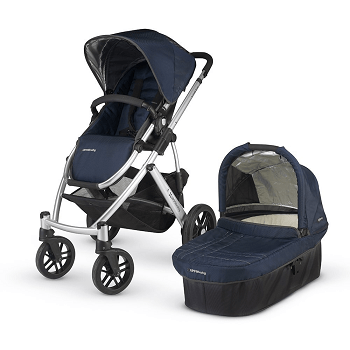 Your home can quickly become over-taken with baby gear, leaving very little room for extra toys. This is one of the reasons I love multi-functioning baby gear that saves a little extra space so I have more room for other essential items, like storage. When you have more than one child (like me, for instance) it can be a bit of a challenge trying to find space for each child’s needs. This is especially true if you are already cramped on space. 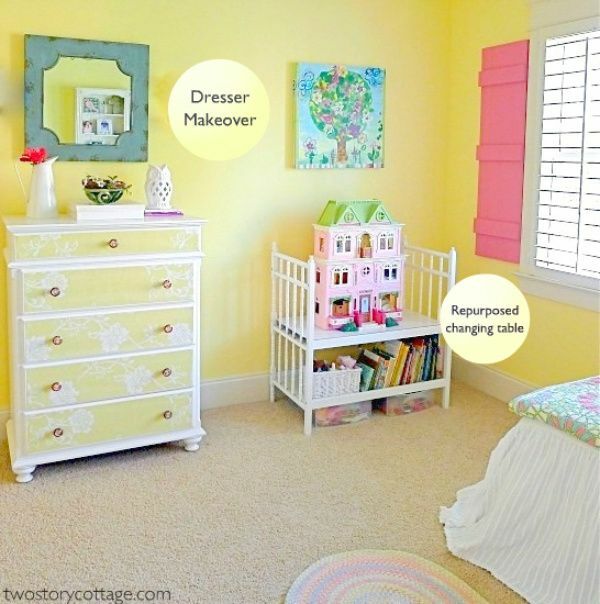 I’ve sourced some of these great organizing tips for kids toys in bedrooms and around the house from HGTV that have really helped to keep things together and well put. I’ve found some of my own ways of keeping things neat in the kitchen with the addition of countless bottles and sippy cups. My biggest challenge was the living room where the majority of the toys were contained as we often spend most of our time here, which is also where we have guests sit when company comes over. Picking Storage Options– If you prefer to stem more towards the modern trends there are several handy furniture pieces that feature hidden storage space like foot rests and storage chests that double as coffee tables. For the bigger furnishings such as entertainment centers, book cases, and side tables I liked to pick pieces that have doors or drawers. These keep stowed items out of sight and out of mind, plus you can put child-safety locks on them to keep curious crawlers from grabbing hold of everything. A coffee table with a glass top is not ideal around children. Swap it out for a closed coffee table with drawers or doors that can close. I’m not as designer-inclined as some people are and really don’t mind toys being visible in my home as long as they aren’t scattered everywhere. Another neat option that helps to keep toys off of the floor are baskets. They’re simple, lightweight, and can be stylish yet functional. 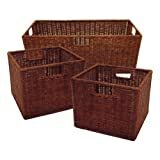 We have a smaller wicker basket for our son’s toys that are easily reachable for him and our daughter’s in a taller basket that has a more slender profile so it takes up less space, yet she can still access it. 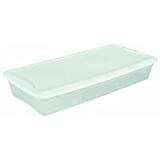 In addition to baskets, boxes and crates are great for storing away things on shelving. If you have shelving or bookcases, invest in some boxes or storage bins that will fit nicely on them to maximize the storage potential of your shelving. Stylish box designs can also be found to coordinate with your decor rather than just plain old cardboard boxes. Repurpose Old Items – If you’ve visited my blog regularly then you know I like to repurpose items and find new uses for them rather than throwing them out. It helps to recycle old things that aren’t used any more and saves you money. Check out a few creative ideas for repurposing a play yard after your baby has outgrown it. Also, for the box ideas mentioned above opt for shoe boxes. They can be the perfect size for narrow shelves to store smaller toys and can be decorated using craft paint to match your decor exactly. When your little tyke was just a baby, before they started crawling and getting into anything and everything the nursery was probably kept spotless or at least somewhat in order. With a toddler that is always on the move and has toys everywhere they go it’s a completely different story. 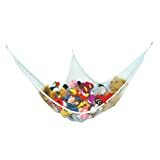 Toy Hammocks – I can thank my mother for this idea. These have actually phased out but these were perfect for keeping all those stuffed animals off of the floor and out of the way. These hammocks are designed to be hung in a corner of the room and neatly store toys overhead so that parents can reach them but kids can’t. It’s a great way to keep the amount of clutter to a minimum rather than having your child take everything out after you’ve told them for the umpteenth time to only take out one thing to play with at a time. Changing Table– Once your toddler has become potty trained or becomes too big to change on the changing table, you can still use it in their room. If you have an actual changing table it makes a great organization piece on account of the shelving space underneath. Should you choose to have a TV set in your child’s room you can use the changing table for the TV and store movies in the drawer/shelves below. You could also use the boxes or baskets idea for keeping things in to place on the shelves and add a little whimsy to it by using old receiving blankets to make as curtains for keeping everything neatly hidden away. Under the Bed Storage – I love these storage containers. They’re made long and low to the ground so that they can fit under the bed perfectly. 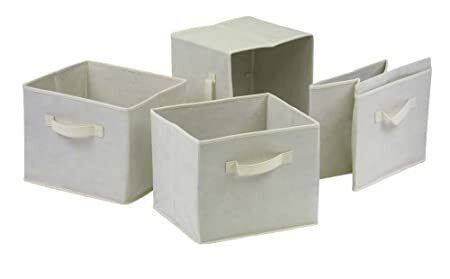 I use these to store blankets and seasonal clothes when they’re not in use under the beds and the crib. Bed skirts keep them out of sight and they are still easily accessible. I’ve already listed a few different products that make great organization for kids toys and other things, but there are several other options I wanted to list. 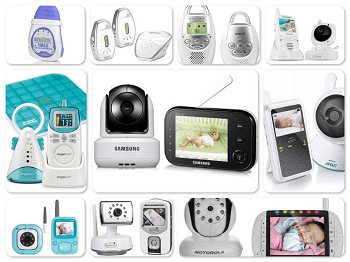 These are some products that I really like for around the house to keep everything in its place. This is actually a hamper meant for laundry, but it’s perfect for my daughter’s toys because it can hold a lot and I really like the design as it saves space. These can be purchased in 3 different colors to match your decor. For my 4 year old this was perfect as she’s tall enough to reach most of her toys but too tall for the baby to get to. 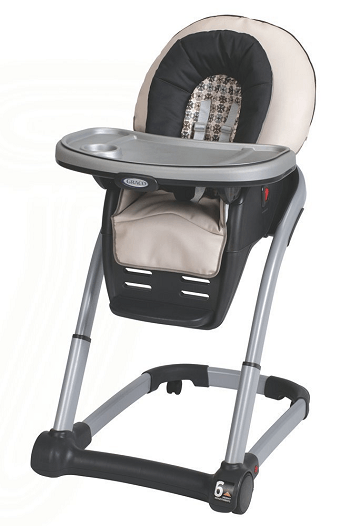 There are also collapsible hampers that are suitable for younger toddlers so it allows easier access for them. I really like the fabric storage bins because they’re so versatile. You can get a nice solid color for shelving in your family room that goes well with your color scheme or choose more colorful ones like the Skip Hop bins featuring various characters for the kids’ rooms. What makes them really neat is that they feature handles so they’re easy to pull out to access the contents and they can fold down flat when you don’t need them. Some even have labels that allow you to designate each one for specific items like books, toys, etc. These are perfect for the kids’ rooms or play rooms because they really provide a space for everything at a height that is easy for toddlers to access. The shallow open bins that are set at an angle make it easy to see what’s inside. The plastic bins are also sturdy and more durable than the fabric bins. They also come in two color options for gender-neutral or specific per your preference. 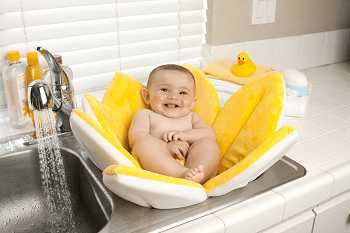 The only reason I don’t own one of these is because I currently use the changing table we have with storage baskets for the kids’ things and don’t have the extra space to place one of these. If space is a concern then go vertical. For our living area I liked the hamper because it blends in much better and saves space. 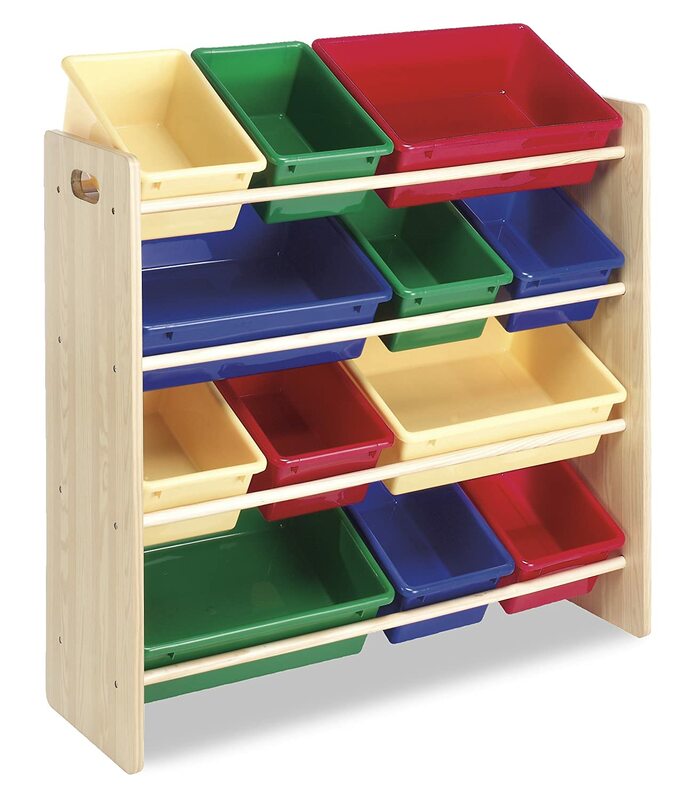 For the kids’ rooms, however, these are great because they have an open design similar to the bin organizer mentioned above that allows for easy access. These can be bought and stacked up to hold more while taking up a smaller footprint for tight living spaces and can be purchased in different colors. I like to use a general purpose caddy for organization in the bathroom. I use it to hold the kids bathing essentials like shampoo and body wash as well as their toys. 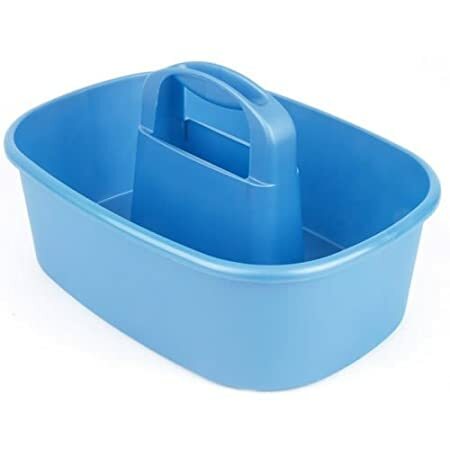 I had initially used this to hold all the bath things I needed for bathing the baby when he was little because I could pick it up and bring it in the kitchen. I do have one of those toy organizers that you can put in the shower but found I preferred the caddy better because it’s more convenient to have on the side of the tub for accessing the essentials I need. Plus these are much easier to clean than some of those that you place in the shower with the suction cups. 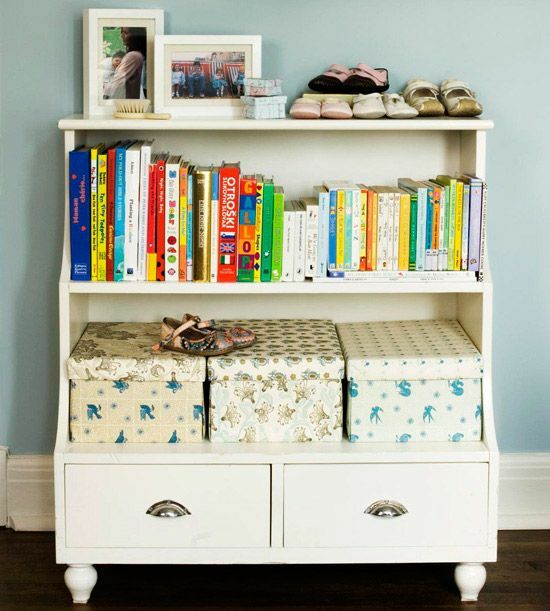 Use these organizing tips for kids toys and storage solutions to keep your home in order, if only for a little while. Having a place for everything will help to keep your stress levels down from keeping the house clean and provides an easy way for toddlers to help out by knowing where things should go.